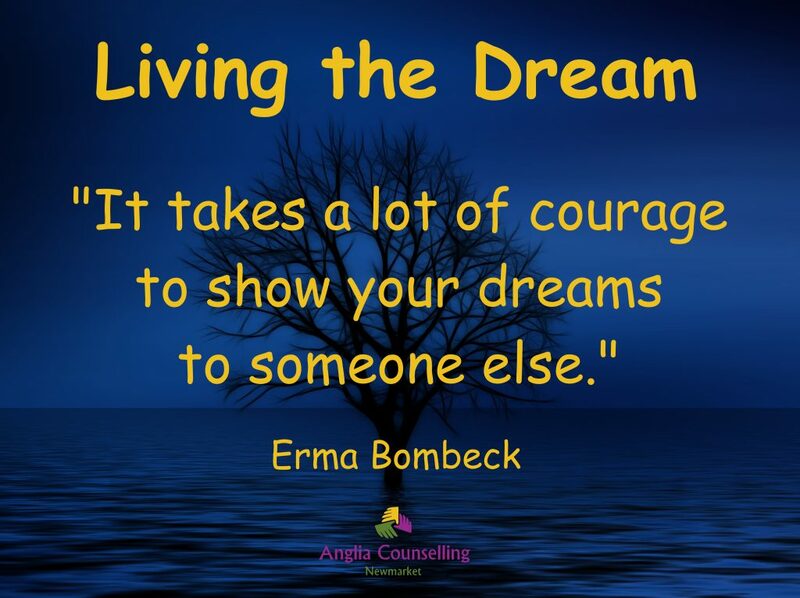 Living the Dream - Anglia Counselling Ltd. It occurred to me recently how easy it is to put off your dreams and how, the longer they are on hold, the further we get from the life we long for. Guest contributor, Annie Trevor discusses Living the Dream. We hear about how people have seemingly sudden transformations – maybe in their career or their relationships – and might wonder how somebody can change so drastically, so instantly. It’s easy to look at other people, but I realised it had been a long time since I thought about my dreams. There are so many reasons for not wanting to handle our dreams. Sometimes it means jumping out of our comfort zone when we feel like we have just got our lives all comfy. It can be scary following your dreams. Click To Tweet. There are risks it might not work out, it can feel frightening. It might be hard to change when people expect you to be always the same person – your friends might be shocked and abandon you. Rejection hurts, nobody wants that. Perhaps it might be that you can’t afford it, or you don’t have enough time. It’s true we don’t have enough time – our lives are just too short to waste them away not being happy. So who is happy? Do you know many happy people? Or even people who are just content? I love that saying about being the change you want to see in the world. It’s up to us to get happy! How lovely it would be to wake up in the morning wanting to get up and get going! How amazing it’d be to enjoy getting fit and flexible without worrying about our weight. Imagine shopping for clothes not just because they suit us but for their colour and texture and just because they put a grin on our faces. How can we get happy? Watching adverts, you could think “well they’re smiling and happy and they’re running so running could make you happy”. Wrong! I’m not saying there aren’t people who love running, but in real life, how many runners do you see grinning away?! I see more who are determined to endure it through wind and rain and the harsh heat of the day – they are focused (can I say sometimes a little smug looking?!) but they don’t look how I thought they would. Yet I have friends who really love it, the fresh air, how it warms them up and makes them feel alive – the things they notice as they run, the fields of horses and sprinkles of wild flowers in the verges. Finding out what we enjoy! It’s that enjoyment that feels like the secret to me. Perhaps happiness is no more than pursuing enjoyment, doing the things we love. When I thought about it, I found it hard remembering doing something I loved – and that’s okay, I may have a little further to go than some people towards achieving the life I want, but I am on my way and the investigating is going to be fun! There are all sorts of things I’d like to try, I can’t wait to get started! What makes you come alive and really enjoy life? Leave us a message and share your ideas! Want to explore how to live your dream life? Want some help? Bob is on hand to guide you on your path, with all his experience and professional advice you’ll be in good hands.